In February we wrote about a contest held by Disney Fairies Pixie Hollow that invited artists everywhere to create their own Fairy house design in which the director of the upcoming movie “Tinker Bell and the Great Fairy Rescue ” would choose a winner who would then receive a vacation for four to the Walt Disney World Resort in Florida as well as have their creation featured at the Epcot International Flower & Garden Festival. That winner has been selected and it is none other than 15-year-old Zoe P., from Frazier Park, California. She and her family were honored on April 3 in a special ceremony at Hollow Garden in Walt Disney World. horticulture team at Walt Disney World Resort. Here is the official press release from the Walt Disney Company. WALT DISNEY WORLD® RESORT – LAKE BUENA VISTA, FL – April 7, 2010 – Disney Online announced today the winner of its “Design a Fairy House Art Contest,” which ran in February on the popular online world for girls, Disney Fairies Pixie Hollow (www.PixieHollow.com). 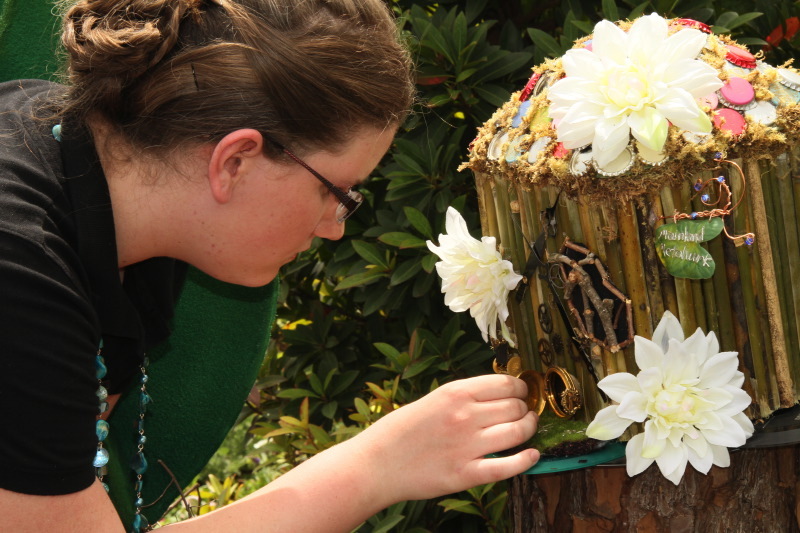 The fairy house, inspired by 15-year-old winning designer, Zoe P., from Frazier Park, Calif., was revealed during a special ceremony on April 3 in the Pixie Hollow Garden at the 17th Annual Epcot® International Flower and Garden Festival. Zoe and her family were in attendance to celebrate the momentous occasion, as the fairy house will be on display for the duration of the festival. The winning house design was selected by DisneyToon Studios filmmakers, currently working on the upcoming “Tinker Bell and the Great Fairy Rescue,” coming to Disney Blu-ray and DVD this Fall. Director Brad Raymond, and the film’s Producer, Helen Kalafatic, attended the celebration to personally congratulate the winner, meet with Tinker Bell fans and sign autographs.